I have never seen my kids more excited than when they came bounding in from the backyard yesterday. They were jumping up and down, giddy and full of exuberance. So much that I could barely understand their squeals of “Mommy, Mommy! Come outside quick! Hurry!”. I trekked after them, down the path that runs along the rockery and quickly understood their enthusiasm. 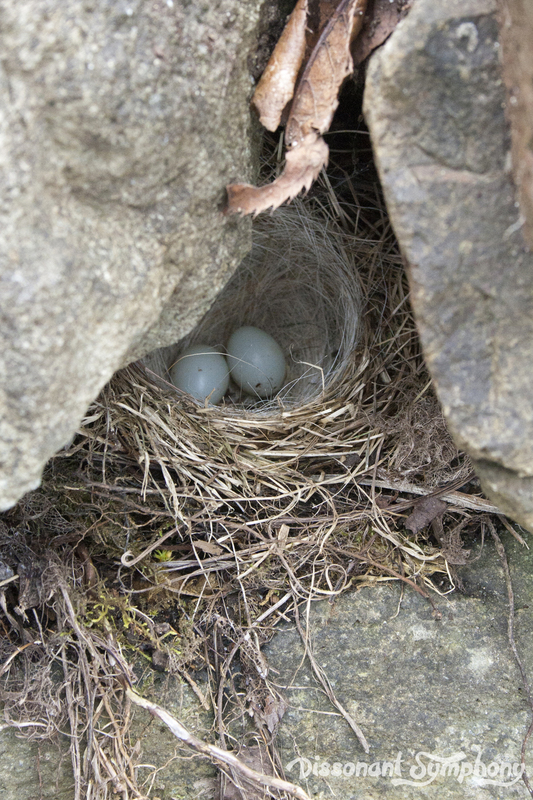 There, hidden in a crevice between two rocks, was a bird’s nest with a single pale egg nestled inside. Aside from stern warnings from my nature loving sister not to ever touch a bird’s nest, lest the mother abandon her eggs/babies, I know precisely zero about bird’s nests. So, after confirming that neither child had touched the nest or egg, we decided to make it a project for the next few weeks. I threw together a little booklet, in which they can record their observations, and ordered up some books from the library so we can all learn something together. Birds are pretty impressive. 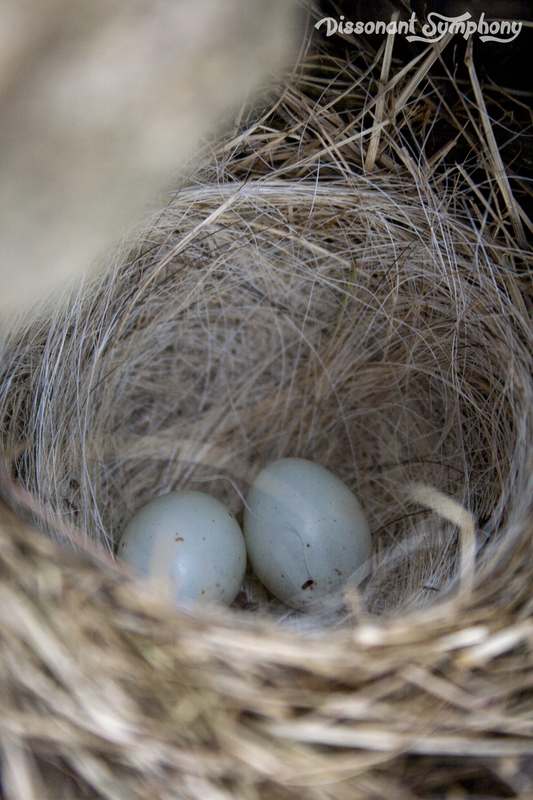 I doubt I could manage such a well constructed nest…and I have hands – not just a beak – to work with. First thing this morning, we took a quick peek at the nest and found another egg had joined the first. Apparently, the glee at discovering nature has no bounds for my kids. You’d think I’d just told them we were going to Disneyland, given how thrilled they were to find TWO eggs. I took a couple quick pictures so the kids could study the construction of the nest without being near it. They jotted down their observations in their packet and are now anxiously awaiting tomorrow when (they are sure) there will be a third egg in the nest. 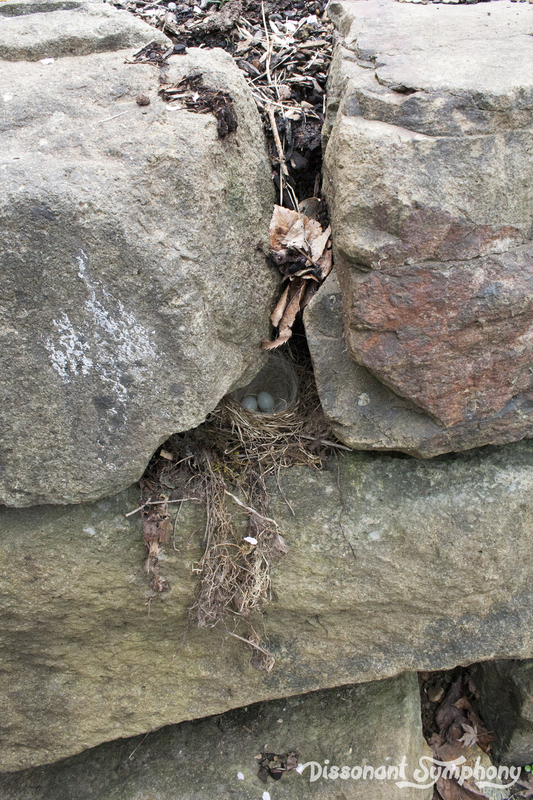 The nest is really well hidden in the crook of our rockery. Protected from the elements from above and nestled all snug in a little hollow between two big rocks. Like I said, birds are impressive. Twigs, dried grass (hay?) and moss make up the outside of the nest. Somewhere near me is an animal shedding pale whiteish and black hair – as that’s the majority of the interior of the nest. I think it may be the giant sheepdog that lives in the house behind us. I can’t think of any other hair that would match the color and texture. The kids are going to keep close watch on the backyard to see if they can spot the momma bird. I’ll keep you posted! 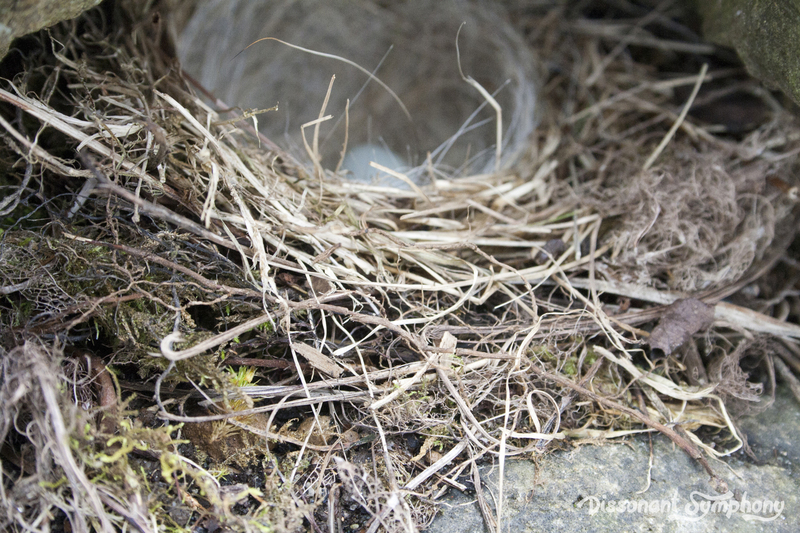 If you have a bird’s nest somewhere near you, feel free to Print Bird Nest Booklet and use it to jot down your observations. Just print and fold in half. My kids are going to use the odd blank pages to print our pictures and include them in the book. 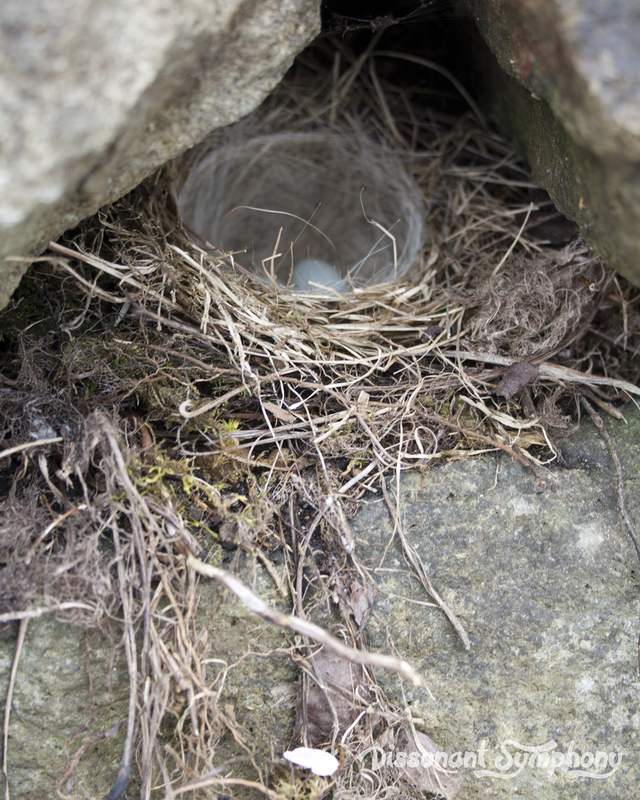 We’ll be collecting materials like the bird used to build the nest as well. If you have any suggestions on bird watching/nest watching, I’d love to hear them.